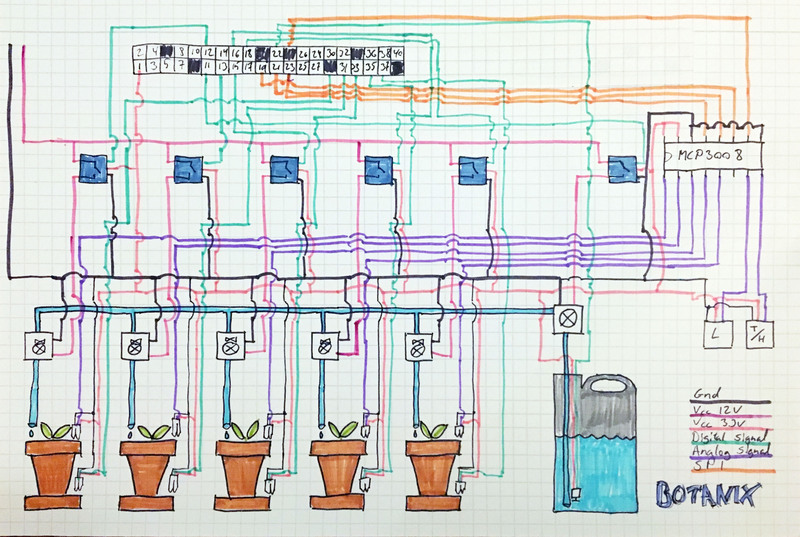 I want to automate plant watering with a Raspberry Pi Zero, a range of sensors, and controls. Because I have a hard time keeping herbs alive in my windowsill. Furthermore, as a software engineer I have a deep felt love for automation. And I like designing and building stuff. Below are my requirements. I will document the build here on the website as I go along. Controlled by Raspberry Pi Zero. Moisture sensors to monitor individual plants. Valves to control watering of individual plants. Water tank to minimize potential flooding and for ability to add fertilizer. Float switch to alert about empty water tank. Sensors for each plant to detect flooding. Light, Temperature, and humidity sensors. Relays to enable control of 12V components. ADC to allow analog sensors. RC filters to prevent noise from long wires for analog sensors. Timer chip (555) to prevent pump from keep pumping if SW crashes. Modular design to isolate implementation of different components. Event driven system based on mails between the different components. Database backend for data collection. Web interface to monitor sensors, watering schedule, and water consumption. Optional: Command line interface to control machine manually.